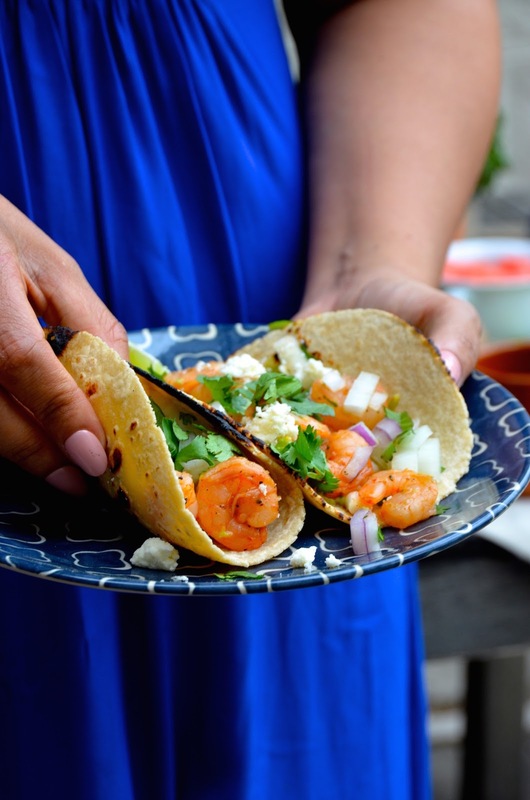 9 Tips for the Ultimate Cinco de Mayo Fiesta! Some people are all about Memorial Day, but for me, Cinco de Mayo has always felt like the true unofficial start of the summer party season. 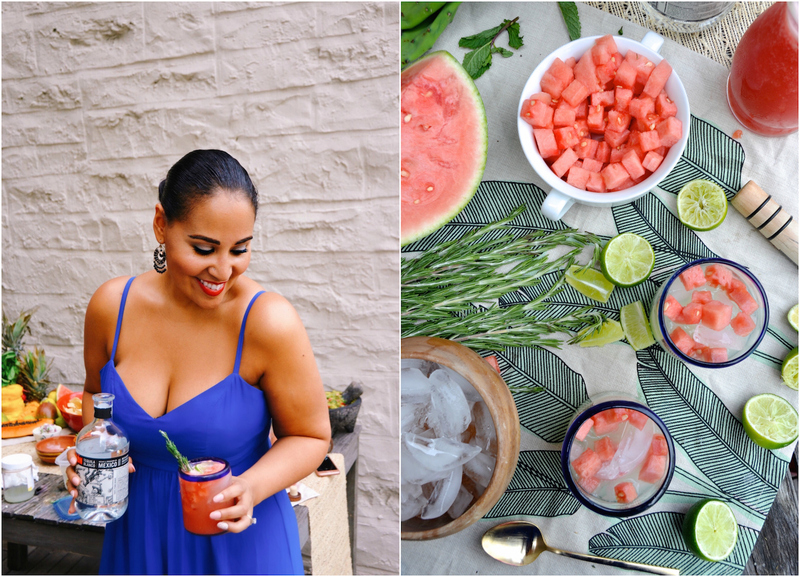 Bold flavors, fun cocktails, bright colors, and the perfect excuse to bring friends together to feast and enjoy—what’s not to love?! 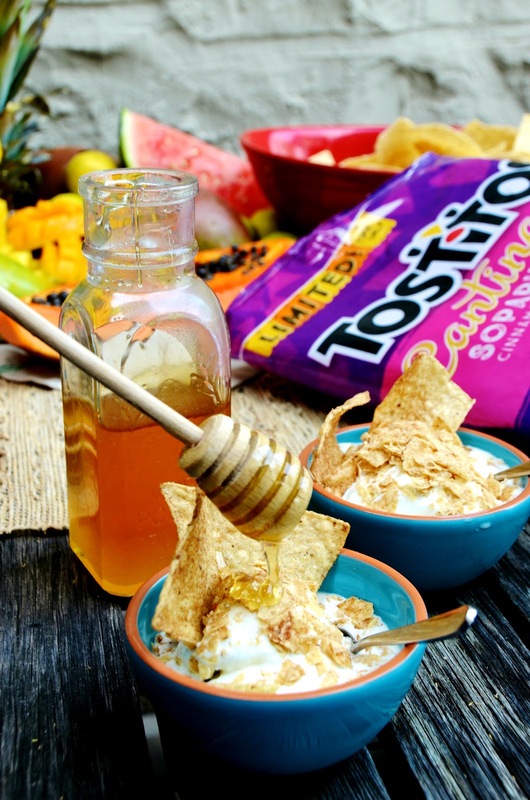 This year, I teamed up with Tostitos to share a few of my favorite summer fiesta entertaining tips—including a GENIUS hack for a 1-minute sundae that tastes EXACTLY like fried ice cream. The secret? Tostitos’s new limited time only cinnamon and sugar Sopapilla chips. Yup! I said SOPAPILLA chips! They are SO GOOD, you guys! Instead, look around your home for items that can be repurposed as decor. Natural fabrics like burlap, linen, patterned blankets or woven mats can be layered to add texture and color to your tablescape. This is also the perfect time to pull out those souvenirs and decorative cutting boards or pottery you bought on past vacations! Instead of paper plates, I like to use a mix of real dishes and glasses--mixing and matching lends the party a fun and casual feel that your guests will appreciate. Fresh fruit like pineapple, mango, and coconuts are also gorgeous and add height and tropical flavor to your table, without creating any waste. 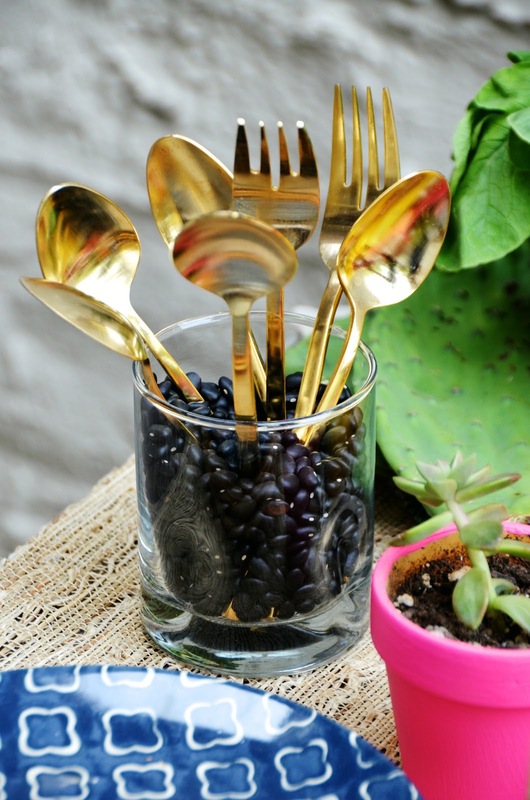 Use dried black or pinto beans in glasses to hold utensils in place. I also love to use black beans on plates to hold small appetizers steady. Dried chilies, cactus leaves, fresh herbs, and vegetables also add lots of richness to your table (and can be turned into delicious meals once the party ends!). My number one entertaining tip? Not everything needs to be from scratch! 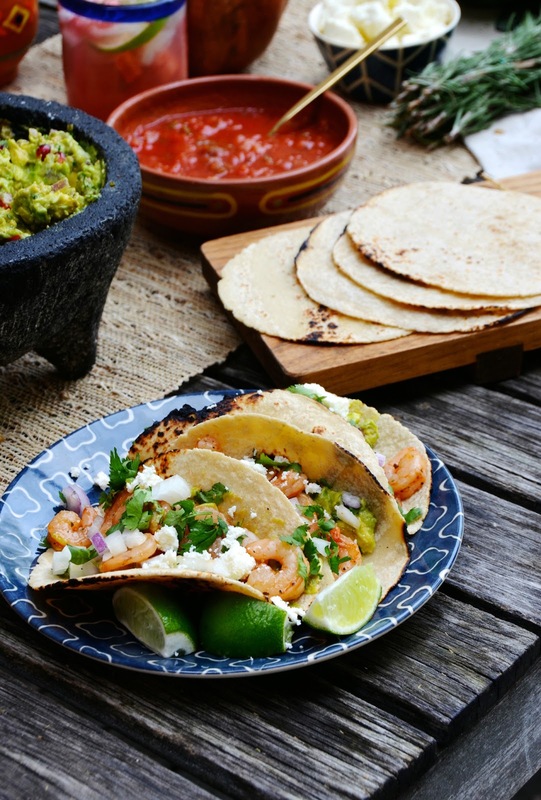 I like to make a few main showstoppers (like my guacamole and these chipotle shrimp tacos), then pair those with some easy store-bought favorites like restaurant-style salsa and tortilla chips. Hot days call for a cool dessert like these easy Fried Ice Cream Sundaes which are perfect for Cinco de Mayo and beyond! These take less than a minute to make, and taste incredible, not to mention EXACTLY like the one you’d get at a Mexican restaurant. 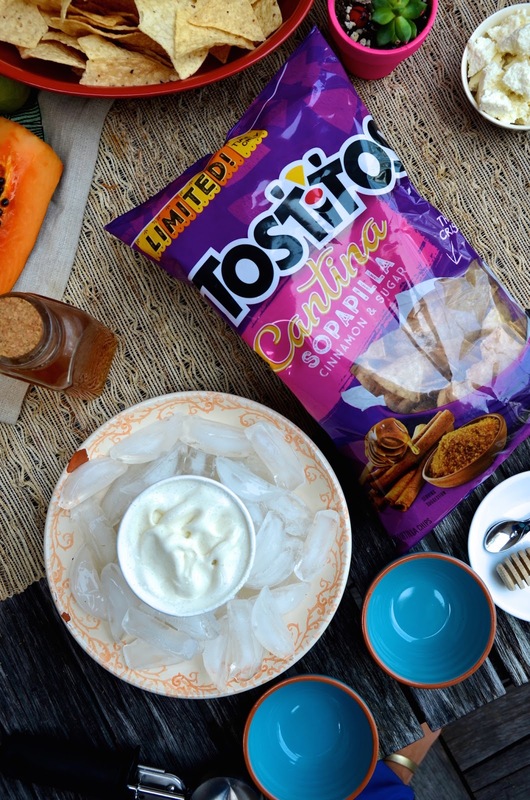 The secret ingredient is a topping made from Tostitos’ new Cantina Sopapilla Cinnamon & Sugar tortilla chips. These delicious sweet and salty dessert chips are great on their own, with sweet dips, or as toppings like in this easy sundae. To make, simply top scoops of your favorite ice cream (I recommend either a simple vanilla bean or something fun like dulce de leche) with a few spoonfuls of crushed chips. Drizzle generously with honey, and serve immediately with a few extra chips tucked in. An easy tip to keep ice cream cold while serving it at a party is to fill a bowl with ice and nestle the carton right in the center. Don’t worry if it gets a little melty—that’s part of what makes it so good on a hot summer day! 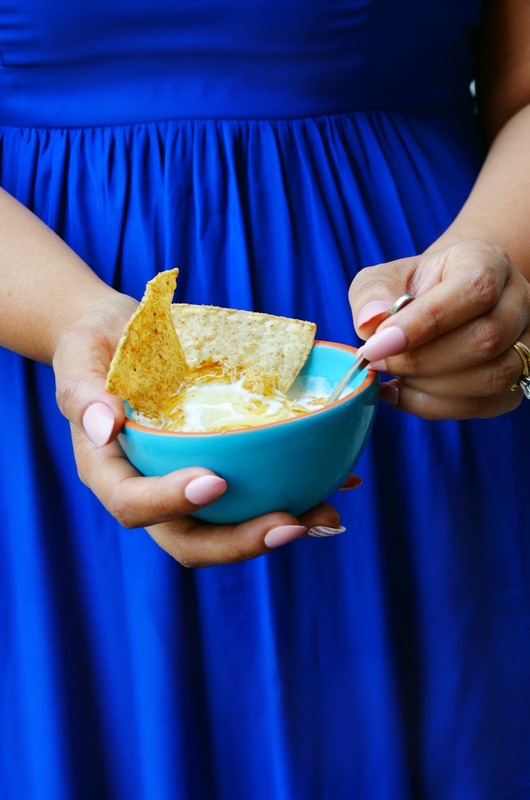 This trick also works really well for dairy-based dips or toppings like shredded cheese or sour cream that should be kept cold. Add a pop of color and exciting flavor to your favorite guacamole recipe by adding fresh fruit like pomegranate seeds, diced mango, or pineapple! The fruit works so well paired against the traditional spicy creaminess of guacamole--your guests will be asking for the recipe. 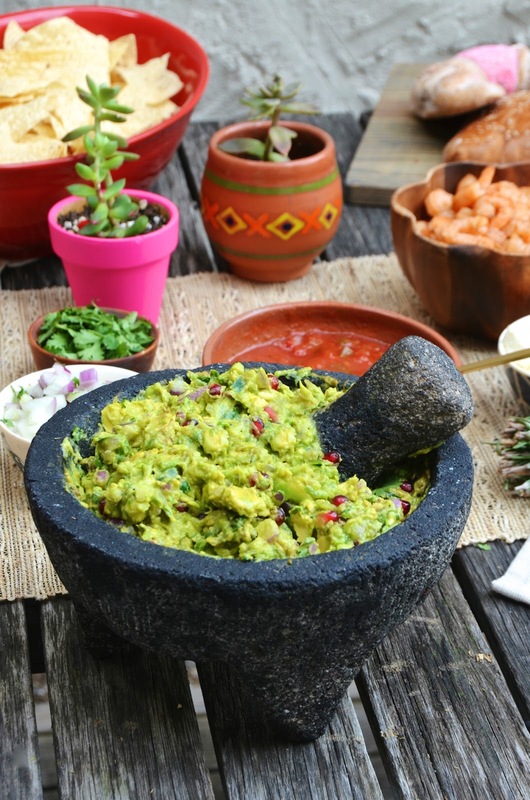 Remember that guac is best when served immediately, but you can speed things up by dicing and prepping ingredients like cilantro and onions in advance, then cutting the avocados and mixing everything up right before your guests arrive. 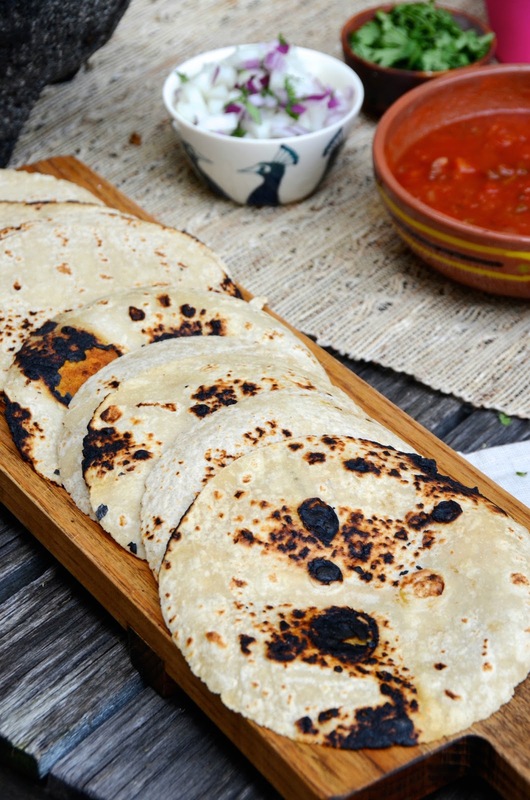 Just say no to cold tortillas! 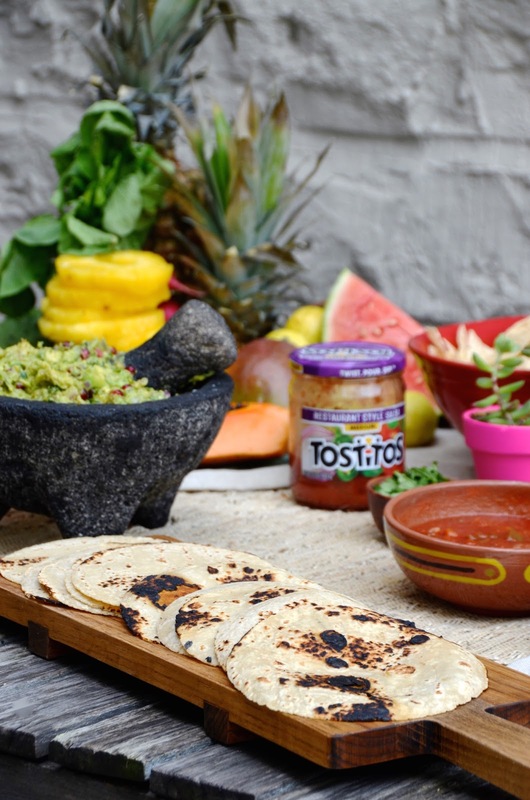 It can be tempting to serve corn or flour tortillas straight out of the package when you’re in a hurry, but taking a few extra minutes to toast them up first will make all the difference in both taste and texture. If you have a gas stove, fire up the burners and place the tortillas right over the flame (I usually do 3 tortillas at a time per burner). Let them cook for about 15-30 seconds on each side—just enough to give them a good char. No gas stove? Use a hot dry skillet (cast iron works best, but any kind will do) or spread them out on a baking sheet and toast under the broiler in the oven. 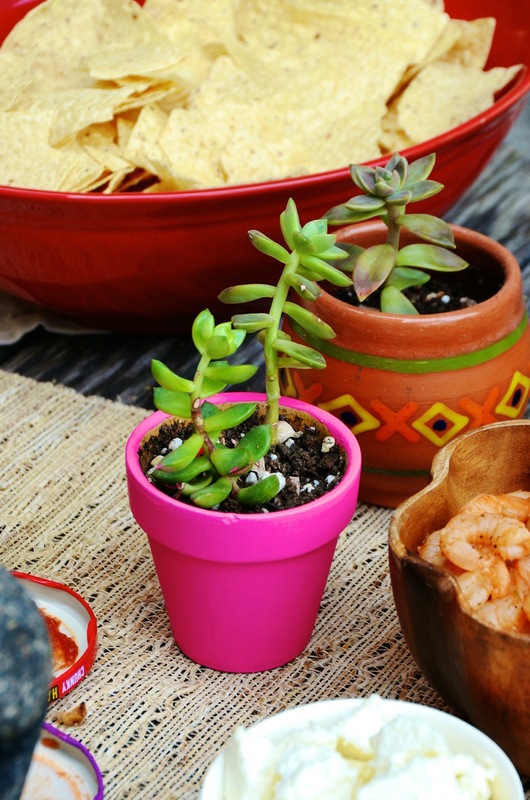 From tacos to drinks, I think DIY is always the best way to go when entertaining a crowd. 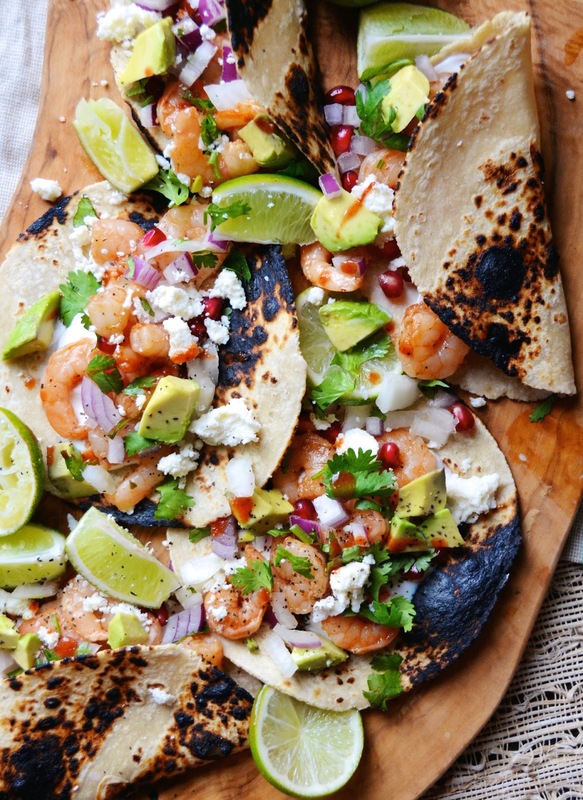 Put out charred tortillas, fillings, and plenty of toppings, then let people make their own perfect plate. For cocktails, I like to put out a couple bottles of my favorite spirit, then put out options for personalizing it--like fresh diced fruit and citrus for muddling, herbs to add freshness, and freshly pureed juices. Keep track of all your guests pictures using a fun customized hashtag, or create a DIY photo booth area with props and fun backgrounds. Want more social media fun? 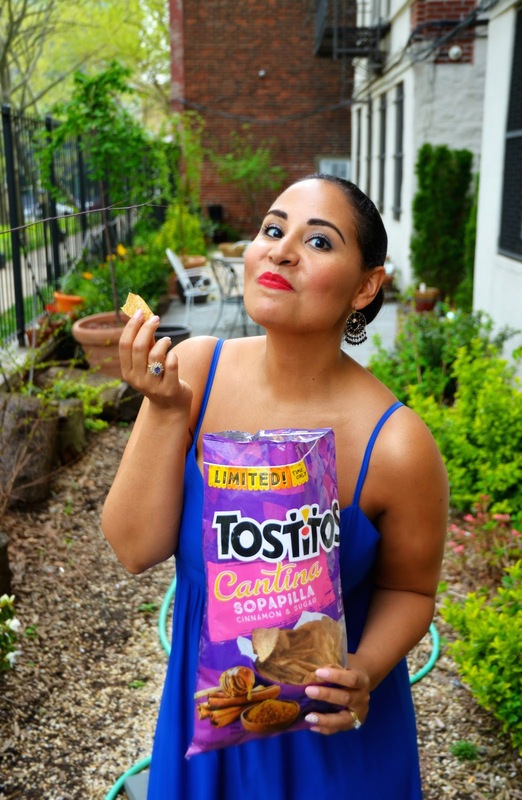 Hop over to https://www.tostitoscantina.com/ to design a digital lookalike piñata of yourself to share with your friends on social. Even better? You can also enter to win the actual piñata—filled with $1000! One winner will be awarded a day through May 5, so hurry over and give it a shot. 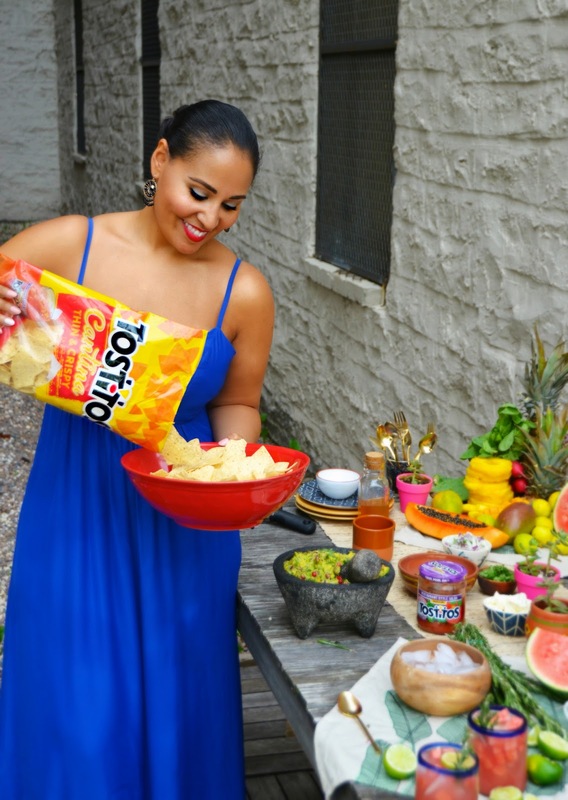 Thanks to Tostitos for sponsoring this fun party post. All recipes and tips are my own (as always!). 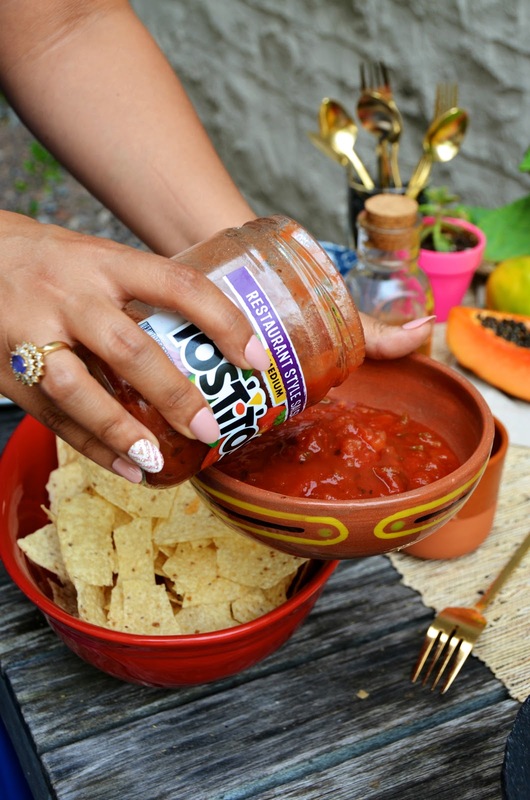 And thank you to you for supporting great brands like Tostitos who make it possible for me to create great content.